For Mary Katrantzou, A/W was about symbolism, insignias, coats of arms and languages of codes, colours and motifs that inform belief. What it was not about was print, and the designer should be applauded for taking that leap this season. Katrantzou's intricately constructed dresses and gowns pulled towards her Grecian roots - linked by ancient medallions (or if you like, the embroidered badges awarded to Scouts or Girl Guides) - remixed through the designer's 'lexicon of luxury'. In Katranztou's hands these motifs were engineered into the most complex of appliqués, laces and brocades. The designer also flew the flag for goddess dressing, with asymmetrical pleating, victoriously draped over one shoulder or inserted into warrior-like pteruges skirts. This linear effect allowed room for her demi-couture needlework to breathe (she's clearly been back to Lesage), before chain mail was unleashed. As her armoured models marched down the runway, there was no doubt that it was a world away from the designer's digital beginnings. 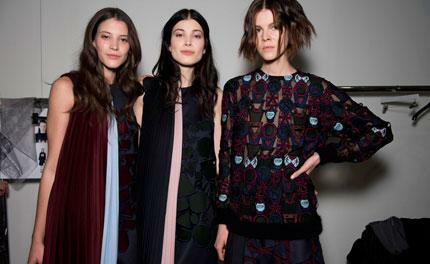 Yet no one seemed to care in the slightest, which Katrantzou should take as a sign in itself: a sign of triumph.